A Shell oil drilling vessel has run aground off an Alaska island during a severe storm while under tow, officials said, as environmentalists again warned against Arctic oil drilling. Federal on-scene response coordinator Capt. 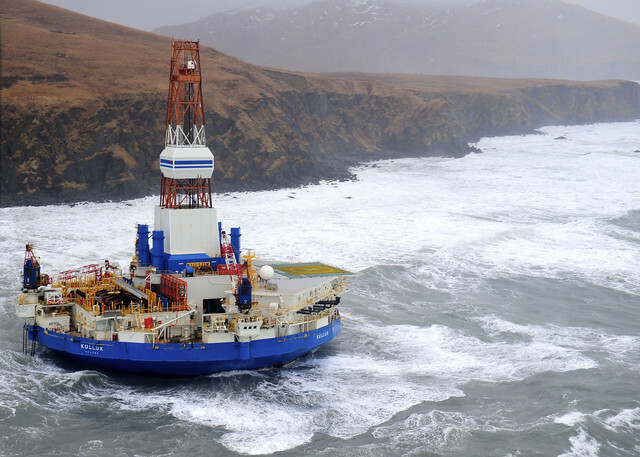 Paul Mehler III said the Royal Dutch Shell conical drilling vessel Kulluk is carrying about 143,000 gallons of diesel and about 12,000 gallons of lubricating oil and hydraulic fluid. “There is no sign of a release of any product,” Mehler told a news conference Tuesday. He said the rig appears to be stable. 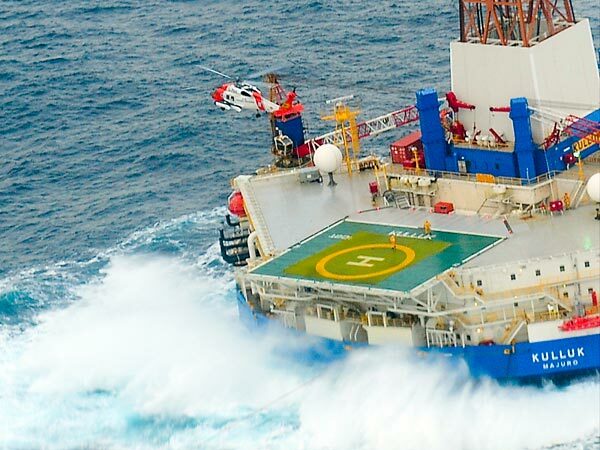 Heavy seas and high winds prevented responders from boarding the rig to check for damage after the vessel went aground late Monday off Sitkalidak Island, an uninhabited island in the Gulf of Alaska 40 miles southwest of Kodiak City. The Kulluk grounded following many efforts by tug and Coast Guard crews to tow the vessel to a safe harbor when it was beset by severe winter storm weather during a tow from Dutch Harbor, Alaska, to Everett, Washington. The area is inhabited by at least two endangered species, as well as salmon, harbor seals and sea lions. The incident started just after midnight local time on Friday, December 28 when a tug lost power as it was towing the Kulluk roughly 50 miles off the coast of Kodiak Island, Alaska, in 40 mph winds and 20-foot seas, casting the Kulluk adrift. A Unified Command consisting of the Coast Guard, Alaska Department of Environmental Conservation, and other federal, state, local and tribal partners was established on Friday and is still working with Royal Dutch Shell and Edison Chouest Offshore to respond to this incident. They are mobilizing spill response equipment and preparing a plan in the event of a spill. “The multiple towline failures only highlight the extremely challenging situation created by the winds, seas, and sheer bulk of the Kulluk. I applaud the efforts of all the vessels on scene and their courage in the face of almost impossible odds,” said Rear Adm. Thomas Ostebo, commander, Coast Guard 17th District and commander of Coast Guard forces in Alaska. At 9 pm Friday, local time, with the weather conditions worsening, Shell officials asked the Coast Guard to evacuate the Kulluk’s 18 crewmembers. “We requested the evacuation for the safety of the personnel. The safety of all personnel remains our top priority,” said Shell Incident Commander Susan Childs. Two Coast Guard MH-60 helicopters crews were launched at 10:30 pm to attempt the evacuation but were unable to hoist the crew because strong winds and heavy seas were causing the Kulluk to pitch and roll to a dangerous degree. 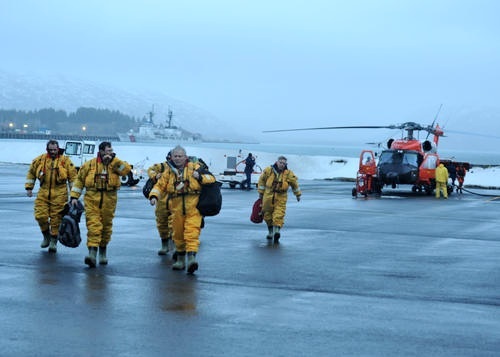 Early Saturday morning, the Unified Command authorized crew members of the Kulluk to drop its anchor off the coast of Kodiak island in an attempt to slow the vessel’s drift and minimize potential impact to personnel and the environment. Two tugs were still attached to the drilling vessel. A U.S. Coast Guard helicopter crew from Air Station Kodiak hoisted all 18 crewmembers to safety by mid-morning on Saturday. After multiple unsuccessful attempts by several tugs and two Shell-contracted response vessels to tow the Kulluk to safety, finally the Kulluk ran aground at 8:48 pm, on December 31. The Alaska Department of Environmental Conservation reports that no evidence of an oil spill was observed during overflights conducted on January 1 and 2. “The Kulluk is upright and is not showing any signs of a breach of the hull,” the agency says. Smit Salvage is heading up salvage operations. Smit is a highly experienced salvage company that has assisted in hundreds of operations worldwide, including the Selendang Ayu salvage that took place off the coast of Western Unalaska in 2004. Today, a five-member salvage team was lowered to the Kulluk by a U.S. Coast Guard helicopter at about 10:30 this morning. The assessment lasted about three hours. A helicopter safely hoisted the team from the drilling unit at about 1:30 pm. The Coast Guard helicopter and crew also delivered a state-owned emergency towing system to the Kulluk, which will be used during salvage operations. Over the past several days, efforts to place a team on-board the rig to conduct the assessment were put on hold due to severe weather conditions. Calmer conditions this morning created a window that enabled the assessment to take place. Ostebo is working with the unified command to ensure that the public, stakeholders and elected officials are kept up to date on the response and its objectives. “This is a very large and complex response and it is important that the American public and our elected officials understand the dangerous and difficult challenges being faced by the response crews,” said Ostebo. “We are continuing our collaborated response with other shareholders in the unified command until the grounded Kulluk no longer poses a threat to the pristine Alaska maritime environment,” Ostebo said. 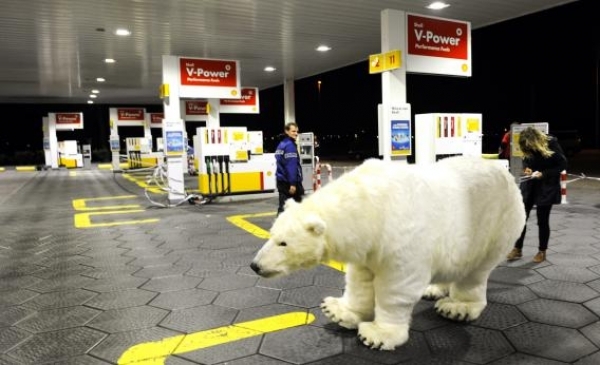 Environmentalists say the incident proves that no drilling should be allowed in fragile Arctic environments. “In addition, the other Shell drill rig in the Alaskan Arctic broke free from its moorings and drifted into Dutch Harbor in July,” she said. Keever said that is why Friends of the Earth is working to create sanctuary zones in the Arctic to help protect it from vessel pollution and oil spills and calling for no new oil drilling in the region.